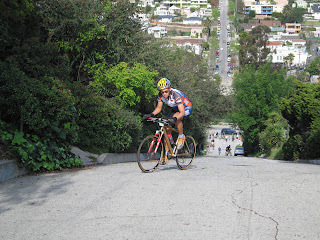 That is me at the bottom of the hill with Eric Ostendorff. 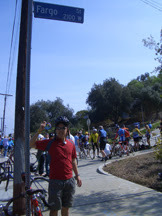 I just got there, and about to register and make my climb. I got number 56. I of course wanted number 14, but Eric got that, 4 times 14 is 56...good enough. Got my number, got my gear. Helmet in case I eat it. Sunglasses for the beating sun, and to look cool. Gloves for better grip...and to look cool. Shoes to keep me locked in. IPod Shuffle to rock to. Oh, and the bike, need that to do this thing. 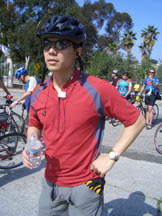 The key to the whole thing, thanks to Eric, 1) keep a steady rhythm, any hiccup in your stride an you may lose control. take it slow. 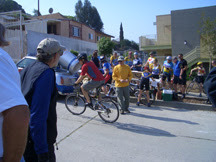 2) keep weight forward, lean toward and on top of bars. Why? Because since the incline is so severe, your front wheel will pop up. 3) go side to side, going straight up is extremely difficult. 4) take long deep breaths, short and fast breaths will tire you out quicker. With tips from Eric and a little encouragement from the crowd, off I go. I am in the lowest gear possible. I have never pedaled that low before. Yeah, like I am going to practice. 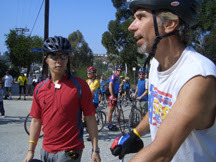 The guy in the yellow shirt is one of the guys running the event. You can see that Red Bull was there next to the registration table. That is me about 20 seconds into it. 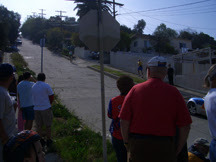 As you can see, from the fence behind, it is pretty steep. And yeah, right about now I am starting to get a little tired. Anyway, I rules are you can try as many times you want to as long as you do not touch the ground with your feet, and you make it all the way to the top, you get a patch for all your troubles. So, I am listening to my iPod and just trying to get in the zone. Unfortunately, there are no photos of my ascent to the top. The photographer got tired just walking up the hill to keep up with me. This is a true test of endurance. I was really getting short of breath, but then Depeche Mode came on the iPod about half way up and that gave me a rhythm to pedal and breathe to. I think I was singing along at one point. After 3-4 minutes I made it to the top. At first, it did not seem that bad. Then the symptoms started to kick in. My arms and legs where numb from the excessive use of the muscles. My throat was sore from gasping for air. I gave my name to the guy up top, and he gave me the patch. I had trouble even standing afterwards. So I rested at the top before I came down on the next street over. 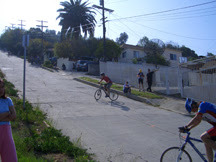 That too was very steep. I thought I was going to flip over the bars while zipping down. 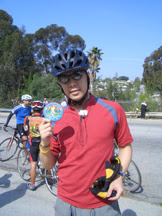 That is a shot of me back at the start with the patch. Ah, much needed water...as if I accomplished something. Wait, I did! Eric is about to go. He could not fail after I just made it on my first try. He already has a patch from a few years back. You only get one, so you get it on your first ascent. In fact, it is the only way for you to get one. I guess you could find one on ebay, but I doubt anyone will sell theirs. I came, I saw, I conquered. I also look goofy with my helmet not properly on my head. 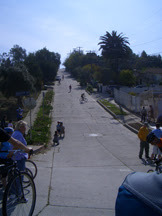 Well, a lot of people conquered the hill today. Some failed, some did it multiple times. Me, I did it once and once is enough. One for one, that is 100% success rate! We both made it. I got my own patch, Eric has his. Maybe next year I will do it again...maybe. Another look from the bottom of the hill. The car is parked about half way up. One last picture. 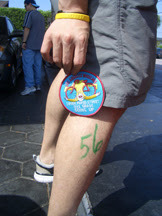 The number on my leg and the patch. Update: Here is the list of riders that completed the climb. Yeah, some dude did it 90 times! 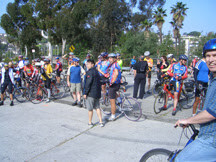 Up next for me, I will try to ride 100 miles from LA to San Diego. 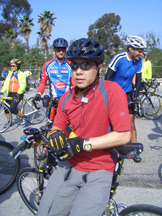 First, I have to get a road bike. Next weekend is the start of Daylight Saving Time. I have expressed my feeling towards this bi-annual waste of time before...pretty much every time we need to adjust our clocks. As a guy who loves watches, I have to adjust each one of my many watches. Already, I have to deal with months shorter than 31 days, and turn that little dial just to keep up. I also have a watch that keeps track of leap years, and never needs batteries...yet I have to deal with "spring forward, fall back". The theory is that changing the clocks results in saving energy and more day light. Uh, day light does not care what time it is. The earth is rotating on its axis and around the sun whether we like it or not. Adjusting the clocks is not going to have any effect on this. You are going to have to talk the sun and earth if you have a problem with the amount of daylight. I do not think they are budging. Energy is another argument. I argue that the amount of energy of people changing their clocks and watches twice a year and the energy saved is a wash. What about the time (and money) lost in the work place from people that forget to change their clocks...phone lines being clogged with friends and family reminding others to set their clocks? Heck, I am wasting valuable Wii time writing this and you are wasting time reading this. Granted that most of the industrial countries participate in this 'trend', less than half the world reset their clocks bi-annually. Some places like Arizona and Saskatchewan do not do this, they are way ahead of their time. Oh, and not everyone starts the change on the same day, there is no global date for this 'energy saving event'. Just like how we cannot agree on Blu-Ray or HD-DVD, Coke or Pepsi, metric or standard. Speaking of standard (yeah, I kinda forced that last sentence to make an argument), they call regular time "standard time". Note that "standard time" is from late October to mid March, that is about five months. Seems to me that daylight saving time is more of the standard than the so-called "standard time". Which leads to my billion dollar idea...NO MORE SETTING CLOCKS!!! Here is the proposal, and I have options for the stubborn. 1) Stick to one "standard time", I vote for summer time, since it is used seven out of the tweleve months. 2) Meet half way, set the clocks 30 minutes ahead of "standard time". There you have it, spread the word and stop wasting your time!